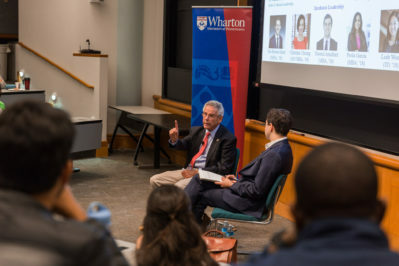 The Elected Leadership Incubator(ELI) is a non-partisan incubator that equips students at the Wharton School and the University of Pennsylvania with training, resources and networks to serve their communities as candidates and elected officials. Training – Provide training and resources for students on what it takes to run for office and win. Community Building – Build a community of future elected and civic leaders who help guide and support one another. Best Leadership Practices – Serve as a knowledge hub to identify best leadership practices for candidates and elected leaders. So that we may learn best practices for future candidates and elected officials, ELI invites distinguished current and former elected officials, campaign managers, advisors, speechwriters, pollsters, and journalists to campus. Through guest lectures, students learn the nuts and bolts of running for elected office and the process of governance. Through formal and informal events, ELI plans and runs community events for students who seek to have a career in elected leadership. Over the course of their time on campus, students will develop a meaningful network of peers who support and advise each other. In the Spring of 2018, ELI will offer students opportunities for more intensive leadership training through campus programming with experts who can coach and advise students on how to develop key skills necessary for effective elected leadership.